A creature of habit, on Sunday morning I carry my empty bottle and glassware to the recycle bin in the garage. I rarely meet anyone in the lift. This week, the 5 people in the lift chuckled when they saw my collection of 3 bottles and one commented that my Saturday might looked more fun than his. The stairwell in the lofts is currently out of bounds, except for emergencies. 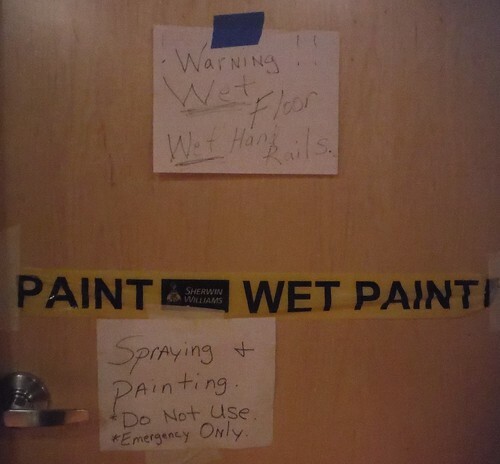 It’s full of paint fumes. People would get high on the stairs if they accidentally used them. 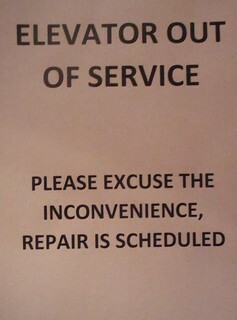 One of the two elevators is not working, due to be repaired within 2 weeks. Sociability enhancements! I’m loving it. Long waits for the elevator to arrive mean people meet each other while waiting. Frequent stops at each floor mean the elevator quickly fills with people, packages and puppies. We talk, smile, laugh. I hope the elevator stays broken for more than 3 weeks. This scribble was published on Tuesday, August 11th, 2015. You can follow any banter on this scribble with the RSS 2.0 feed. You can share your inspired musings after typing the anti spam word near the bottom of the page. But no Pinging because its too naughty.